My name is Brigitte and I live in the south of Germany in a very nice mountainous region. I started stitching back in the 1990s. We had a Canadian exchange student living with us for several months and in the evenings she was sitting on the couch stitching on a cross s titch project. 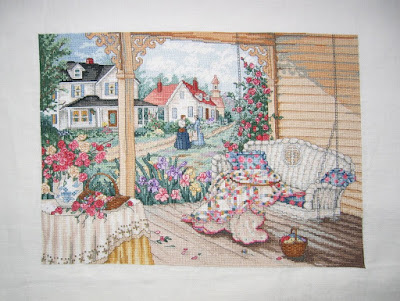 Back then I didn’t know anything about counted cross stitch, the only thing I had seen before was stamped cross stitch. And she stitched on a Mirabilia angel or fairy. 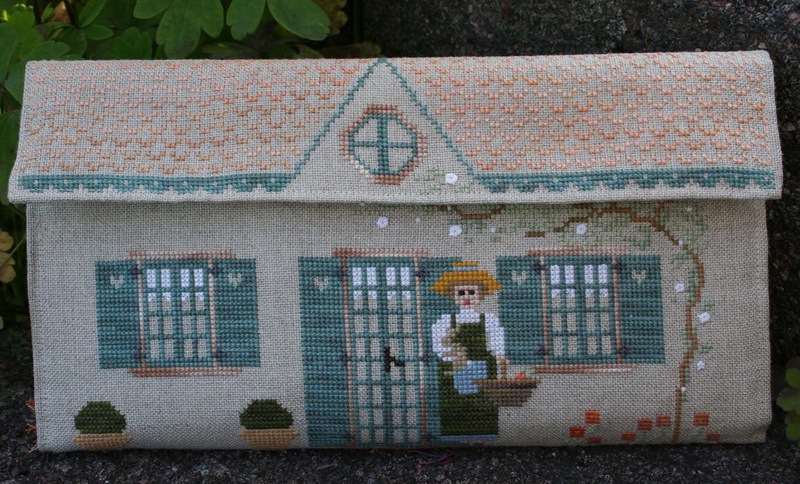 Then she showed me how counted cross stitch works. And after discovering a German company who sold books and patterns from US-designers I was hooked. 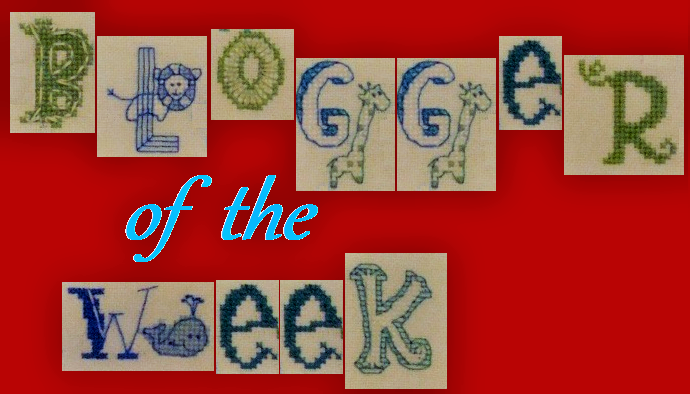 Some online stitching friends started blogging and I liked the idea to have a blog of my own. And as you can see from my blog title there is no story behind it, lol. That might be Good Neighbours by Paula Vaughan. 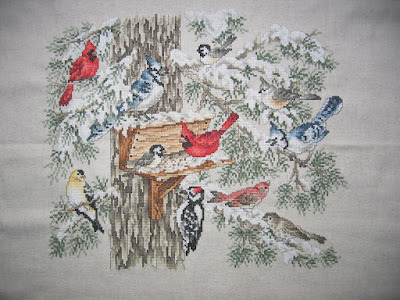 It was my very first big project and it uses 74 colours (if I remember right) and fractional stitches. Back then I didn’t even know what fractional stitches are. So it was a real adventure. I once had stitched and fully finished an ornament for an exchange. But just before wrapping it up I spilled a cup of coffee over it. I threw it away and stitched the ornament again. I’m just happy with cross stitch. I have a box and a drawer with not-fully-finished projects. I fully finish some of my smaller projects but the rest goes into the drawer or box. For me the process of stitching is the most important. I would say all of them. Not really a secret: I love western movies, particularly the old ones. My favourites are El Dorado and Rio Bravo, I can watch them over and over again.. Thank you, Brigitte. Everyone says how much they enjoy this feature. If you have not been interviewed and would like to be, please email me. If you know a brilliant blogger, then pass their details on to me so I can discover them too. So nice to learn more about Brigitte! Your work is beautiful and so varied in styles. Interesting interview...thanks for hosting these Jo. It's great to learn more about you Brigitte! I love Rio Bravo as well. :) Love seeing the photos of your projects too. Brigitte I enjoyed learning just a bit more about you my friend. And I adore Trousse Mimi Lapin by Les fées brodeuses. Oh, schön, auf diese Art mal ein paar deiner älteren Projekte zu sehen :) Von Paula Vaughan muss ich auch irgendwann mal was sticken, die hat ja tolle Sachen gemacht. Und lustig, dass du auch erst in den 90ern mit dem Sticken angefangen hast, ich dachte, du wärst schon viel länger dabei! es war schön den Beitrag zu lesen und einiges über dich zu erfahren. Das Bild von Paula Vaughan sieht wunderschön aus. Ich mag die Vorlagen von Paula Vaughn und habe auch einige in meiner Sammlung, muss aber gestehen, ich habe noch nicht eine einzig von ihr gestickt. Das Trousse Mimi Lapin ist ein richtiger Schatz. It was really nice to learn more about you Brigitte. 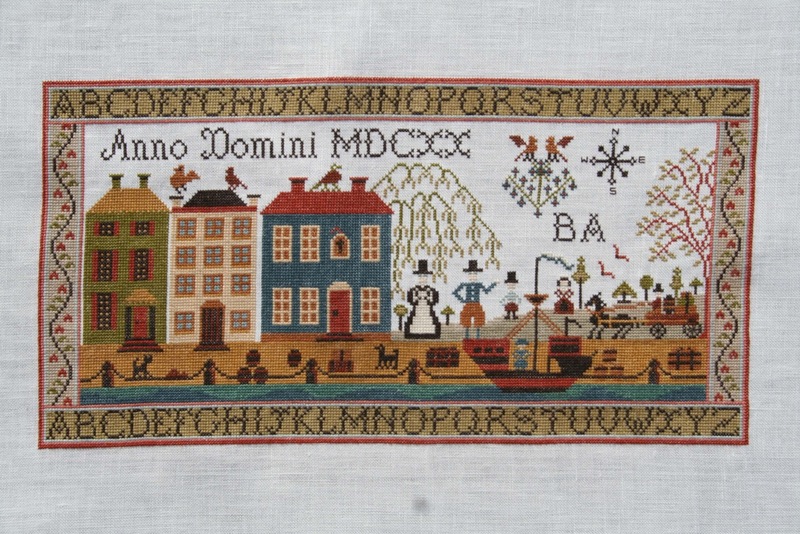 All of your stitched pieces are lovely. Thank you, Linda, for your nice comment. So nice to learn more about you and see your work. Nice to get to know you better Brigitte. So nice to meet you. I have added you to my blog roll. Love your Prairie Schooler, it's lovely to learn more about you. 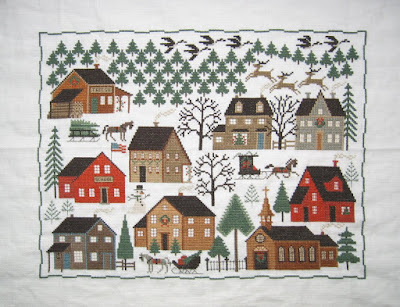 Christmas Village by PS was such a fun stitch. Thank you for y<our comment. Glad to learn more about you Brigitte! I LOVE your Good Neighbours piece, it is beautiful! 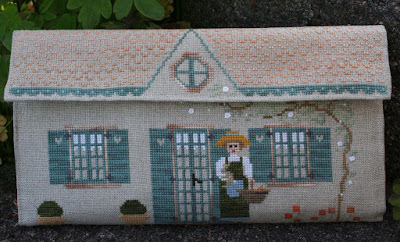 Your Paula Vaughn cross stitch is really lovely. I already know you but you have added some lovely pieces in this post! I especially like the Plymouth Sampler.I'd love to stitch that one day!AriadnefromGreece! Thank you, Jocelyn, for your nice comment. 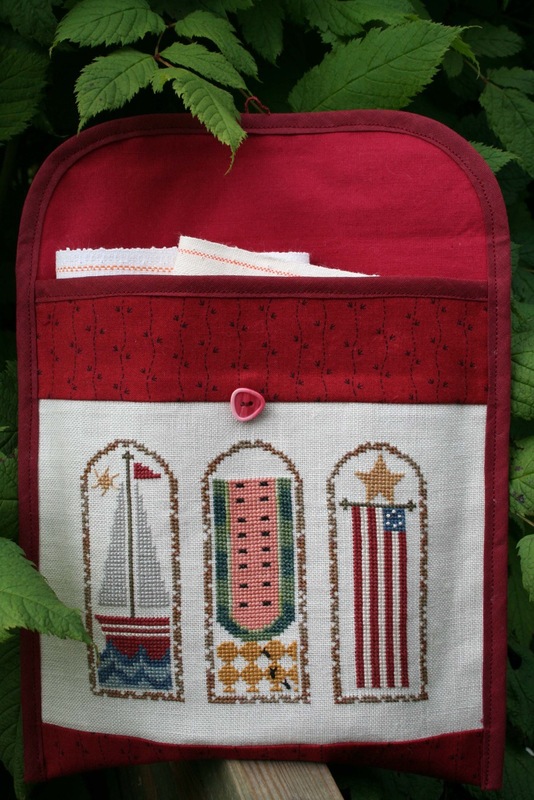 Wow Brigette ,you have a candy box of stitching , so many beautiful designs .